We will be running 9 Shuttle vans. We are running as many shuttle as we can! Think of the shuttles as a one-way ride. There will not be a shuttle waiting at the drop off area waiting to take you back to the expo. It is easy and less time consuming to pedal back to the event expo that to wait for a van to show up. We recommend you have a ride planned BEFORE you get on a shuttle. Once you have a ride planned make sure to get on the correct shuttle. 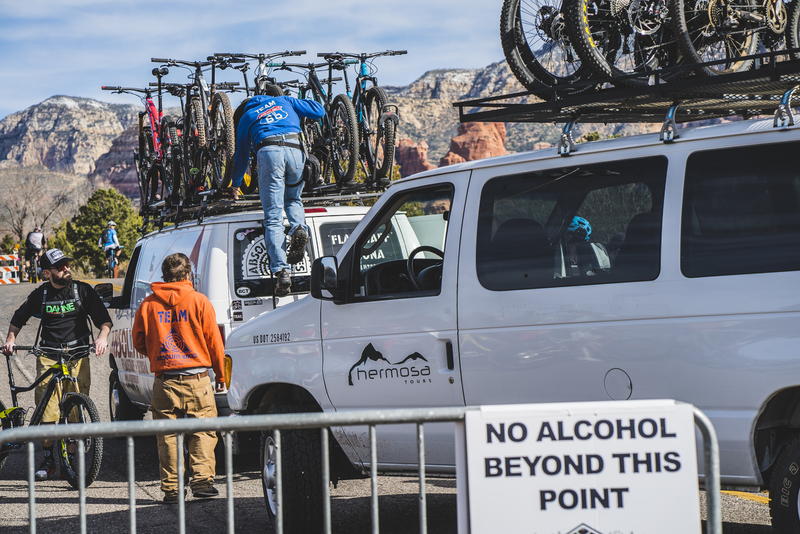 Shuttle will be going to the Arizona Cypress Trailhead off Dry Creek Rd. The trails you may want to ride in this area are Chuckwagon, Mescal, Aerie, Cockscomb, Canyonof fools, Dawa, Anaconda. Shuttle will be going to the Scorpion trail head behind the high school. The trails you may want to ride in this area are Scorpion, Pyramid, Sketch, Skywalker, Herkenham, Old Post, Ridge. You are a short spin back via Hwy 89A. Shuttle will be going to the Broken Arrow trail head and then Yavapai Vista trail head near the Village of Oak Creek. The trails you may want to ride in this area are Broken Arrow, Hog Wash, High on the Hogs, Llama, Slim Shady, Easy Breezy, Templeton, Hi-Line. You are a short spin back via Hwy 179to Hwy 89A. The return ride will take you about 35-40 minutes.